OK, we turned back the clocks yesterday and we had our first California rain on Saturday. In my book that means it’s officially fall and time to start breaking out our favorite comfort foods. Here’s a pasta staple at our house, Penne a la Vodka! This dish is a classic in my book and it’s SO delicious. The best part about this recipe is that I usually have everything on hand to make it, which makes it an easy dinner fill in. Make sure you serve this up with some warm crusty bread to soak up all that yummy sauce. This pasta tastes even better the next day as the penne soaks up all the sauce overnight. Bring a large pot of salted water to a boil for the pasta. 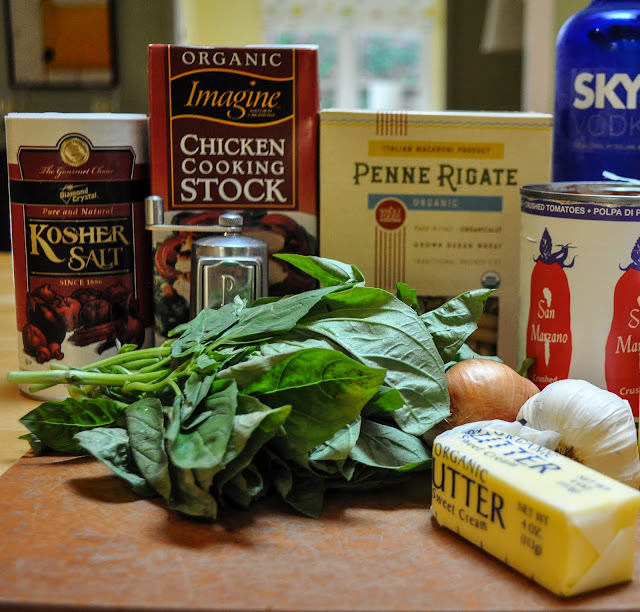 Prep all your ingredients, measure out your vodka, chicken stock and heavy cream. Mince the garlic cloves and the shallot. Add the oil, butter, garlic, and shallots to a medium-sized skillet set over medium heat. Gently sauté the garlic and shallots for about 3 to 5 minutes, (or until they start feeling soft) to develop the shallot’s sweetness. Add your 3/4 cup vodka to the pan. Reduce the vodka by half, this will take 2 or 3 minutes or longer. Note: The first time I made this sauce I went by the time estimate and did not really check to make sure the vodka was reduced. Well, you can guess, my sauce tasted like vodka and I had to throw it away. So please make sure you reduce it by half. TIP: To make sure the vodka is reduced by half other than looking at it, just smell it and if you smell vodka, then it needs to be reduced a bit more. You want to smell the shallots, garlic and butter, not the vodka. Once the vodka is reduced, add in the 1 cup chicken stock and the can of tomatoes. Bring sauce to a bubble and reduce heat to simmer. Season with salt and pepper. Simmer the sauce for about 10-15 minutes to thicken it up a bit. While the sauce simmers, cook your pasta in the salted boiling water until cooked to al dente (with a bite to it). Drain pasta and then return pasta to pot. After the sauce simmers and the pasta is finished cooking, stir the 1/2 cup cream. Let the sauce return to a boil and then immediately remove it from heat. It’s not the prettiest looking sauce, but it tastes great! Add your sauce to the pasta and toss to coat. Serve up a heaping amount of pasta into each bowl. Add your fresh basil and Parmesan and enjoy! I hope this pasta becomes a staple in your house! Gently sauté the garlic and shallots for about 3 to 5 minutes, (or until they start feeling soft) to develop the shallot's sweetness. Add your ¾ cup vodka to the pan. Once the vodka is reduced, add in the 1 cup chicken stock and the can of tomatoes. Bring sauce to a bubble and reduce heat to simmer. Season with salt and pepper. Simmer the sauce for about 10-15 minutes to thicken it up a bit. After the sauce simmers and the pasta is finished cooking, stir the ½ cup cream. Let the sauce return to a boil and then immediately remove it from heat. Serve up a heaping amount of pasta into each bowl. Add your fresh basil and Parmesan and enjoy! Making this and like five other dishes on your site right now (I cook all day Sunday to supply us for the whole week of lunches and dinners). Drooling already! MMM…this is one of my favorite Rachael Ray meals. Makes me want to make it soon! Hi Annie! I hope this pasta turned out well for you! I love this recipe and we make it often! The candle in this photo is a lavender one. This is my go to scent. I recently purchased the cranberry scented one from Target and I love it as well. I love anything Meyers though, especially the lavender counter spray. oh I want to have this tonight….it’s not even 6, so this is what I’m making…it looks divine! I will be sure to reduce the vodka…good note! Is that candle one of those new ones from Mrs. Meyer’s? I saw those the other day at Target…just wondering if you like it the scent? ?